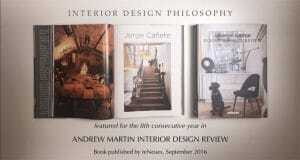 The book Interior Design Review from Andrew Martin released! For the 8th consecutive year Interior Design Philosophy is featured with a new project in the Andrew Martin Interior Design Review considered by the industry as the bible of interior design. Finaliste des “Finest Interiors Award"